There's been some crazy hype talk around the webs I thought the servers may overload hahah but in the short term (ie: right now) I'm just really excited with what he's doing, long term I'm cautiously optimistic to see him strut his stuff in the show. I'm not going to make point predictions because I want Johnny to show what he's capable of and to pave his own path instead of all these comparisons to players of past. I think the biggest adjustment for him is going to be the 82-game season.... but to be fair it's good training being in WC, he played his NCAA season including post-season, then a 1 game stint on the Flames, and now having the high intensity WC schedule (9 games?) a lot of b2b's so he's definitely headed in the right direction! Of course I am excited. I think he will forge his own legacy. I just hate to compare him to a 7x 40 goal scorer and 3 time stanley cup & hall of fame player at this stage of his career with only 1 NHL game under his belt. I don't care if it is dreaming or conjecture. Soon you guys(dreamers) will have him on such a high pedestal he won't ever be able to reach your expectations of him. I'm right there with you I just think it's a bit comical with all these player comparisons, not really meaning here, but there are some quite outlandish ones I just gotta step back and be like, "whoa I dunno about that... Lets get through year 1 and see where were at." But I don't mind it, it's kind of expected now that everyone's pretty starved for Flames hockey! As a Flames fan. I am happy he is signed with us. I don't have any idea of what he is capable at the NHL level, not do I have any expectations. What I have is hope. Hope that he can make the transition. Hope that he can prove detractors wrong. Hope that he can be a long-term piece of the Flames. He is one of the prospects that I have hopes for. Add his name to Granlund. Baertschi, Monahan, Poirier, Arnold's as players I hope to be contributors to Flames future success. Gaudreau keeps surprising me every game, but just to tame expectations a little more, his two big games at the WHC have been against weak countries like Belarus and Germany, he has 7 points in 2 games against those two teams and 3 points in the other 5 games. I will say that Johnny Gaudreau looked a little bit like Patty "Showtime" Kane in that game versus Germany. I am not saying he will be that good, but the size, the skill, and there flair is reminiscent of Kane. I still think he has a long way to go just to prove that he can be an NHL regular, but I am excited to see what he can do. Johnny played very well in this tournament. For some reason he really likes to score against us (also scored one in an exhibition game before the WC). His performance really keeps me thinking he could be starting with the big team next season. Although can he repeat that performance on NHL ice, there he hasn't that much space? I guess trainig camp will answer that question. Johnny isn't there to be a black and blue guy. Smaller skilled guys are not there for the physical presence he is there to provide offense. It is imperative that the flames surround him with fast larger guys to create that time and space. I think bill Arnold was all that for JG at BC I'm not sure bill will get to that point in the NHL this yr maybe him a billy will do the same in Adirondack if JG doesn't move up to the NHL level at the beginning of the season. Hope we can find a site that will show some of the AHL games next yr. Should be fun to watch with or with out JG on the team. Fingers crossed here pretty exciting stuff! Vote For Johnny Hockey Here!! I think little Johnny should take a year off hockey and spend it in the weight room or Addy. At 150 lbs this is a white head waiting to explode. You thought RNH had weak shoulders, wait till some of the finest NHL heavy hitters (Kronwall, Weber, Phaneuf, Brown, Chara, Weber, Richards, Neil, Torres) see 150 lbs little Johnny coming down the side boards or open ice. Everyone is a target, and little Johnny is no exception. I see the great potential in little Johnny, but putting him on an NHL ice surface this year will only put him in sick bay. This kid needs to toughen up, strenghten up, muscle up, then come and take a deserving position next year. As if the AHL is full of "little guys". There's big hitters down there trying to make a name for themselves all day long by lining guys up and crushing them into the boards on a nightly basis. There's nowhere to hide. If Gaudreau is mentally ready for the NHL, then he should play NHL. He maybe mentally ready but is he physically ready? I think a season in the AHL side stepping and dodging the slower bullies down there will go along ways in preparing him for the lightning fast bullies in the NHL. If after a half season he has proven he can make the next step then so be it, bring him up. I however do not see any scenario where JHG starts the season on the big team. The AHL is more a goon league than the NHL. More guys with a chip on their shoulders because they will never make the NHL. There is no hiding in the AHL, and in fact, the NHL probably has people with a bit more respect for player safety (knowing the impact to their careers and pocketbooks). You are overlooking the scenario where Johnny Hockey hits training camp at full stride and makes it obvious he belongs on the team. Everywhere he has played he has shown his elite skills, so there is reason to think he will do it again. Does he (or could he) rank higher on the depth chart than Sven? Byron? Galiardi? GlenX? Bouma? Cammi? Three of those guys are RFA's. Cammi may not sign, so that opens up the top line LW. Hudler most likely plays at RW. Colborne probably plays RW again. After that you have Reinhart, Granlund, Agostino as possible LW prospects making the team.
? / Monahan / ? 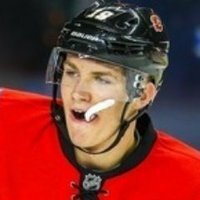 I think everyone needs to save there breath with the "Johnny should" stuff until we get more then 1 game to see how he handles himself on the ice, if he can play his game then let him, if hes getting pushed around out there and looks like a boy among men then send him down for some seasoning! Which is what I was saying about training camp. He will have opportunity to plays in the prospects games, the main training camp and some pre-season games. If he makes a case to play in the NHL, then that is where he starts. BPA should get the start unless there is a definite reason to hold them back (skating issues, defensive lapses, attitude, etc.). My own opinion (and I have been labeled a homer) is that JH is a standout in TC and pre-season, and is kept on the Flames for the season due to his skills and play. No prediction or expectations for scoring. That is all we can ask for from a prospect in their 1st NHL season. Not every player has to go through the AHL first. I think every one is forgetting College hockey players are not little kids they are grown men in there late teens and early 20s and every one of them were out to get little Johnny. His line carried the team every game and he put up numbers except 1 In the regular season he will make the bigs right out of the gate he is going to be just like Mono put up the numbers not every game but I would bet he wins rookie of the year that is my prediction. Burke goes out of his way to call Gaudreau tiny every time he talks about him. Burke is big on managing fan expectations RE prospects to avoid another Baertschi. Treliving talks about using the Detroit model of developing prospects in the AHL. Both have talked about time needed for college kids, specifically Gaudreau, to adjust to the pro game. Plus Burke talked about a couple of big hits in Gaudreau during the world's that he was concerned about. I am not sure the writing can be any clearer that Gaudreau at least starts in the AHL. I also think it may take him a half of a season in the AHL to adjust before the points start piling up. Manage your expectations. Better to be realistic and pleasantly surprised than to expect the positive exception. I don't doubt that Burke would have concerns about a player of Johnny's size taking hits. I also think that the Detroit model has its merits. But we don't have a team built like Detroit. We just don't have that many NHL players. If a player like JH or Granlund is one of the top players in camp and pre-season, it is a little hard to send them down. Another tidbit about Detroit; DeKeyser never actually played in the AHL, and went to Detroit right away. Agree 100%. And I highly recommend for people to watch the video I posted just before this. Burke is adamant that they will take their time with JH. Burke believes in him as does Treliving but they want to make sure he can play at this level without getting creamed. You know teams will focus on him if he stays with the Flames. JH is a very talented player, of this there is no doubt, but he is (in Burke's words) tiny and I think will take some time before seeing any full time action in Calgary. He needs to season in the AHL in my opinion and I would not be sad to see him start the year there.